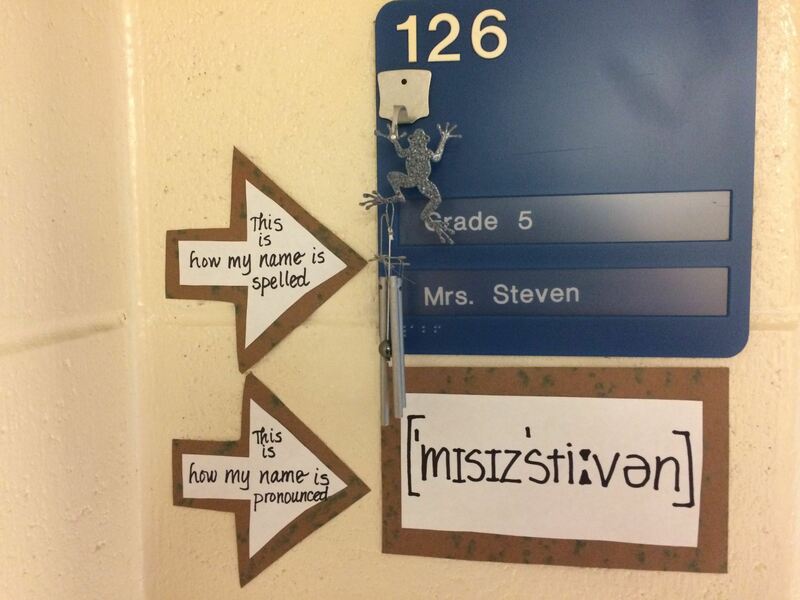 Spelling Does Not Represent Pronunciation, But We Know What Does! I’ve started this school year a bit differently than those in the past. From the very first day I wanted to drive home the point that a word’s spelling represents meaning. In other words a word is spelled the way it is to reveal the meaning of the word. And just saying that, or writing that on a piece of paper and hanging it in the front of the room just isn’t enough. It is a foreign idea to the children I teach. All of their lives they’ve been told that letters represent sounds and when trying to spell a word, one should sound it out. And when the word beauty comes up, the adults say, “Oh, that one? 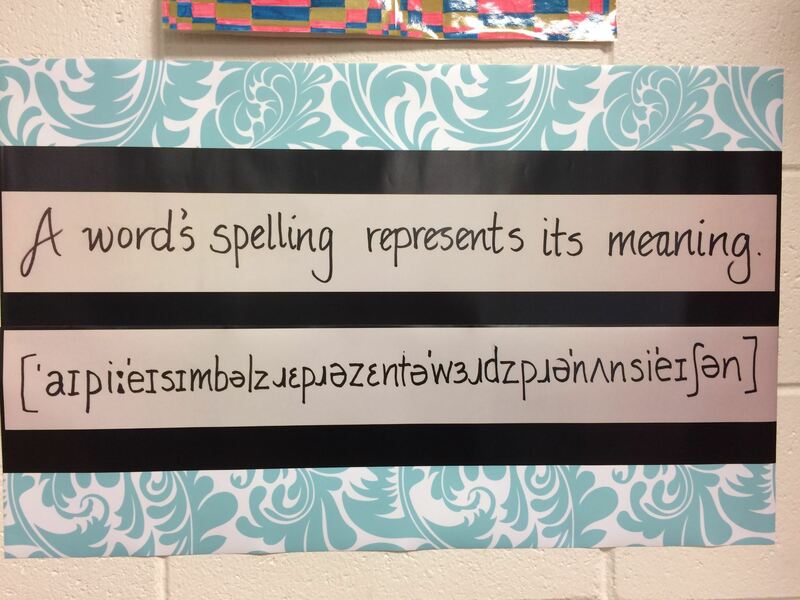 You’ll just have to memorize it.” So even though students know what a lot of words mean and can use them in sentences, they do not typically expect to find clues to the word’s meaning in the word itself. But how to get them to stop thinking of letters as representing pronunciation? This year I decided to teach them IPA! 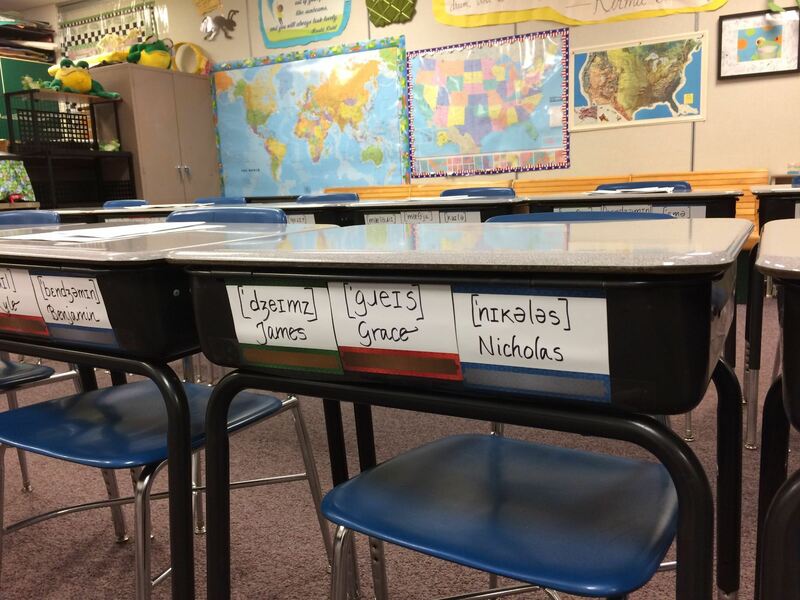 Before they even walked in the door I wrote their name in both spelling and IPA on the front of their desks. And all the labels for their notebooks were written in IPA. And there was this subtle sign on the door to my classroom. The next step was to make a list of everyone’s name and put it on the board. Since I see three groups of fifth graders throughout the day, I decided to make the list on a sheet of paper that I could remove and reuse when needed. 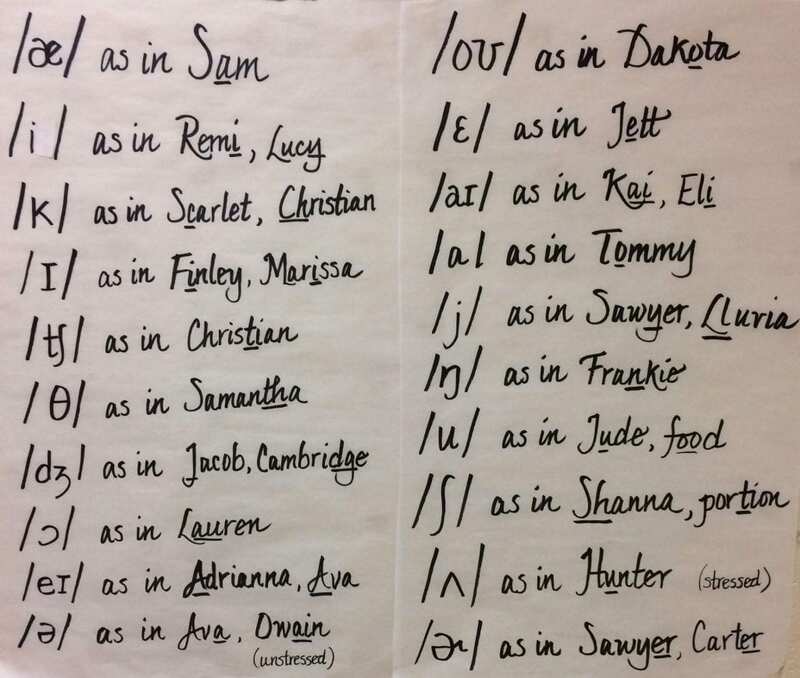 Once the students were all seated, I asked them to look at the list of names and tell me what they noticed about the symbols used to represent the pronunciation of student names. Here is a video from that very first day. As you can see, and as we will refer to in the days to come, this first day was a day to collect evidence. 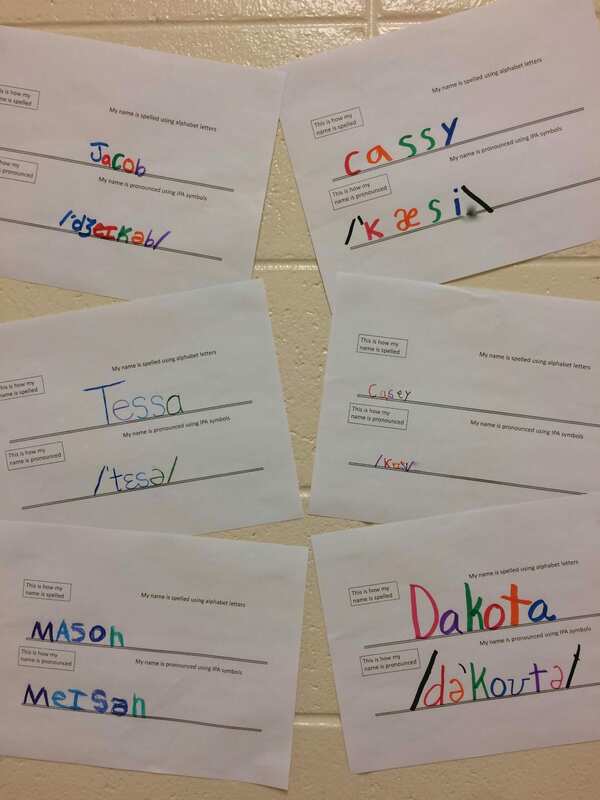 In each class the students noticed different things. 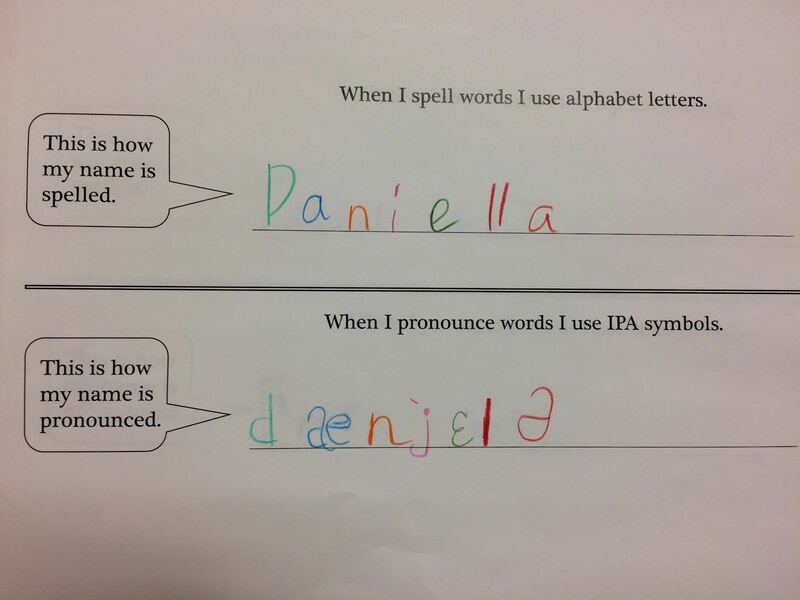 But the one thing they all noticed was that spelling and pronunciation rarely line up with a one-to-one correspondence. We had a particularly interesting discussion about the <y> in both Rylee and Katya. The <y> in Rylee is represented by the IPA symbols [ai]. Why two symbols to represent one letter? Then we pronounced those symbols and realized that in vocalizing that letter, our mouth begins in one position, but ends in another. 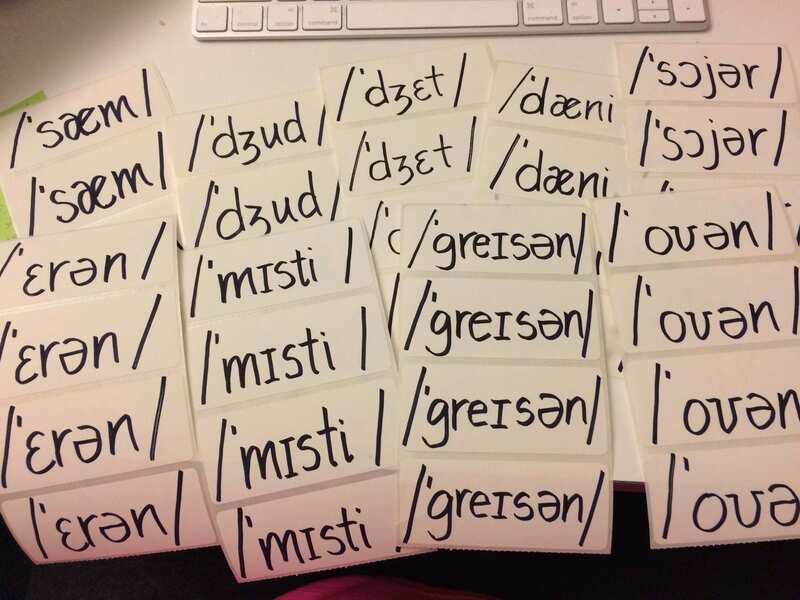 It’s not a huge difference, but we all noticed that our mouths closed a bit towards the end of the pronunciation. I told them they had just experienced a vowel glide. We were gliding from one IPA symbol to another as we pronounced the <y> in Rylee’s name. We compared that to the <y> in Katya which was represented by the IPA symbol [j]. One letter, yet two very different pronunciations! In the video, Jackson noticed the symbols [ən] which were consistently found as the last two symbols in the IPA pronunciations of [dʒæksən], [eidən], and [kiːən]. 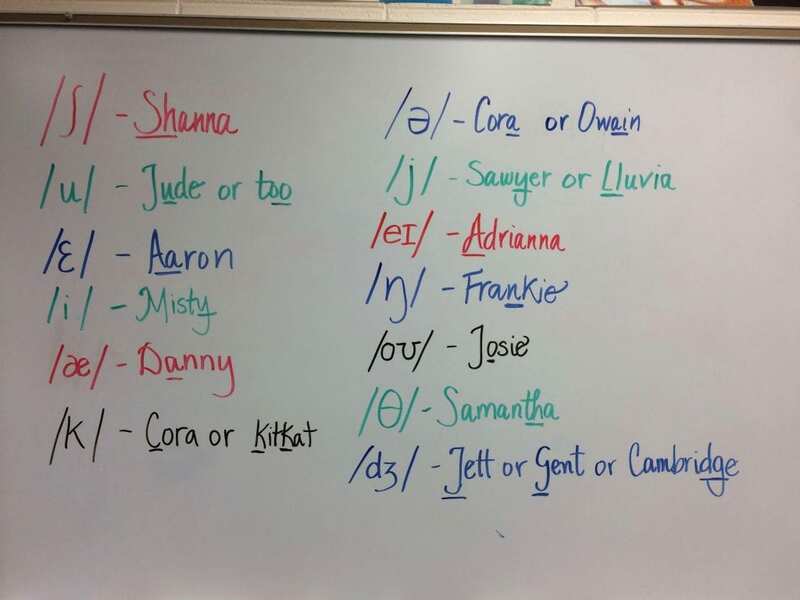 We compared that pronunciation to the spelling of the names Jackson, Aiden, and Kian. We realized that the pronunciation was consistent even though the spelling was not. More evidence that spelling does not represent pronunciation. Towards the end of the video, we looked at the pronunciation of the name Charlotte. 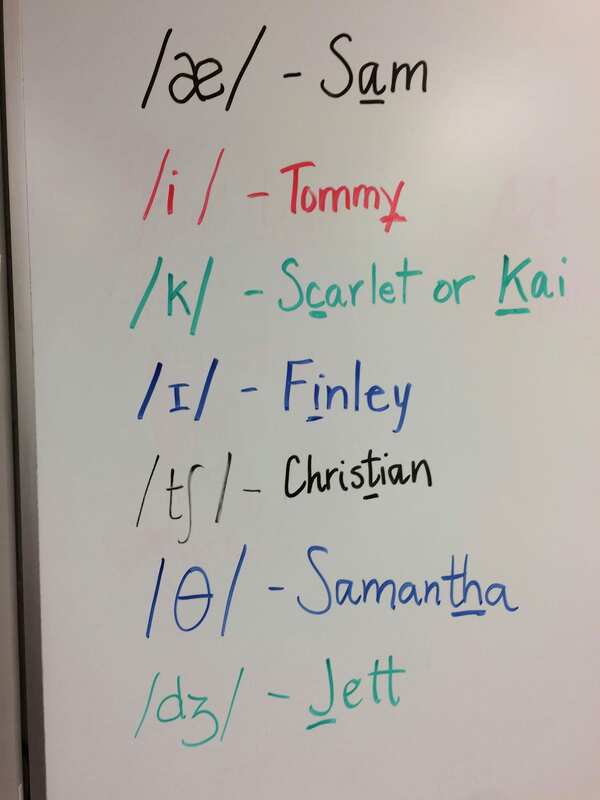 Students noticed that the IPA symbol that represented the <ch> spelling looked kind of like a stretched out <s>. It is the IPA symbol [ʃ]. We were able to identify three spellings that could be represented by that symbol: <ch> as in Charlotte, <sh> as in shoe, and <t> as in action. Hmmm. More evidence that sounding out a word won’t help much with figuring out how to spell that word. This was not in the video, but in another class a student noticed the symbol [θ] in the name Matthew. The IPA was [mæθjuː]. Many of the other symbols looked somewhat familiar (even though I reminded them that a symbol and an alphabet letter are not the same thing), but this one looked strange and completely unfamiliar. Having already noticed the symbol [æ], and understanding that it represents the same pronunciation as the <a> in Mallorri and Katherine, we could figure out that the symbol [θ] must be the pronunciation of <th>! But what was equally interesting was the fact that although Thomas had a <th> spelling initial in his name, it was represented by the pronunciation /t/ and not [θ]. 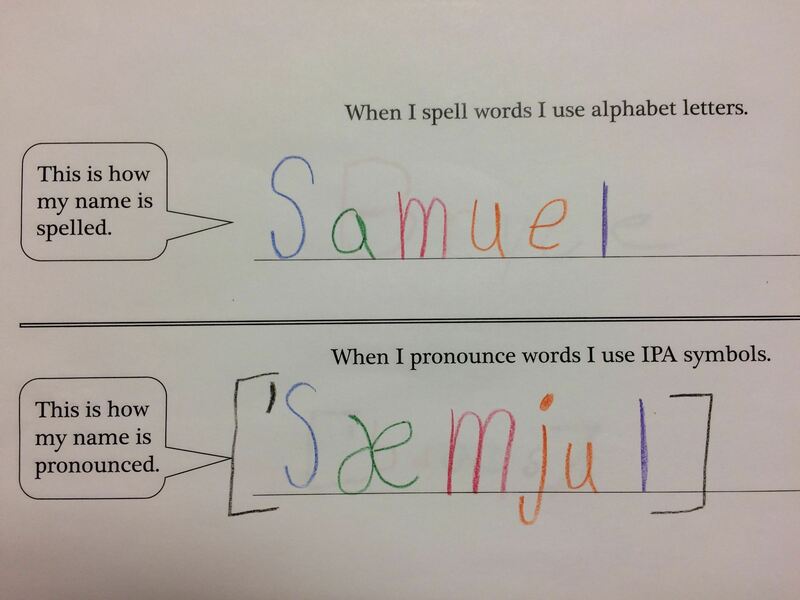 This was more evidence that spelling doesn’t represent pronunciation! If it did, every time we found a <th> spelling, it would have a [θ] pronunciation! 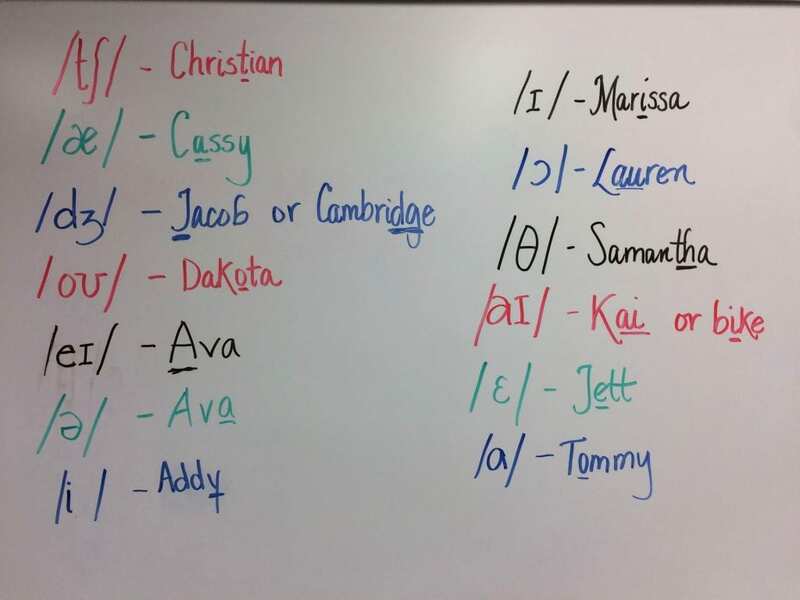 On this day I purposely left the wrong list of student names hanging on the board. And you know what? 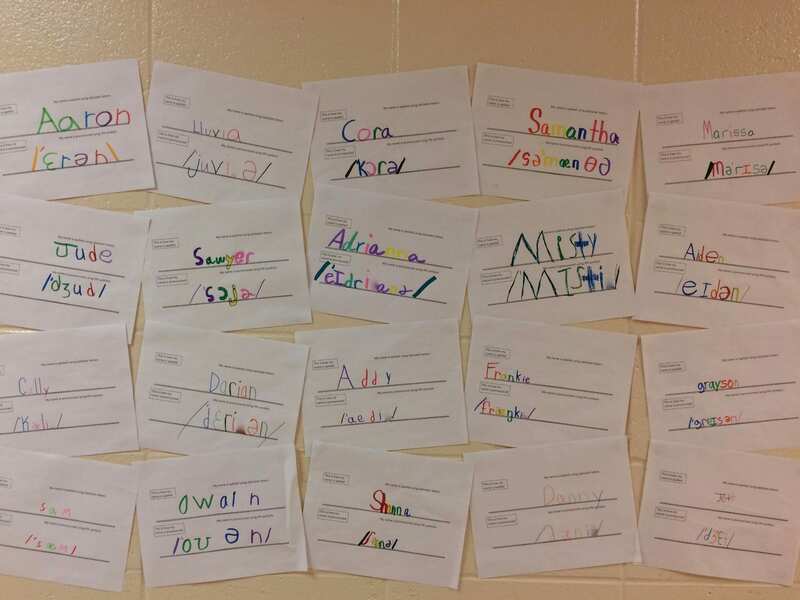 As a group, they enjoyed figuring out the pronunciation of every name on the list. 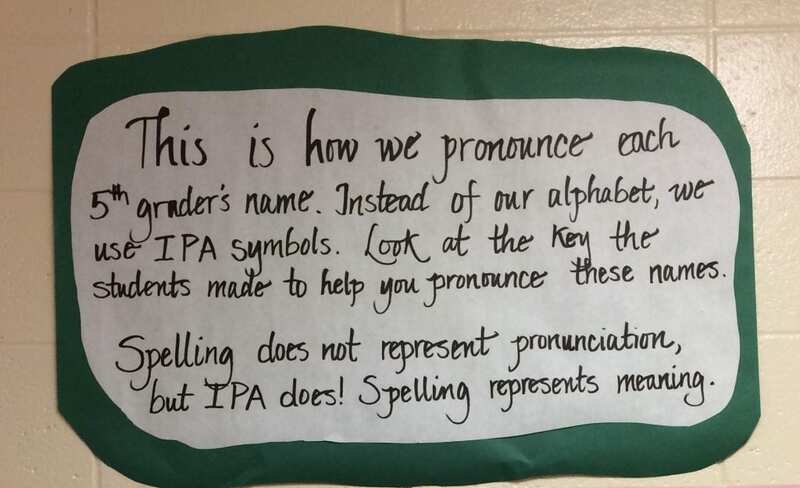 It helped that they knew most of their peers’ names, but still, they were pronouncing IPA! They were already familiar enough with it to recognize many of the symbols and the pronunciation represented by them! Next I had them open their notebooks and write their name. 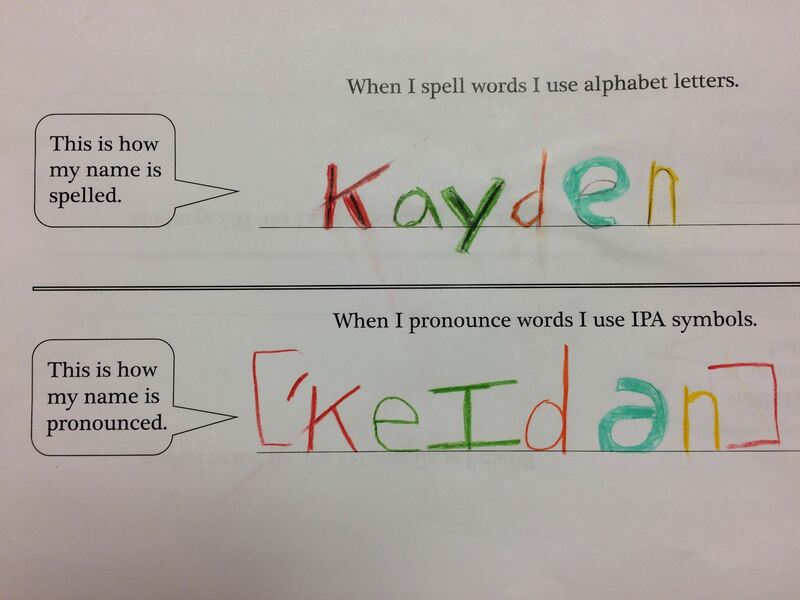 Then below their name I asked them to put the IPA pronunciation of their name. I modeled this by using my own name on the board. Next I drew a line from a letter or letters in the spelling of my name to the IPA symbol or symbols that represented it. After that I rewrote both and color coded them to point out the IPA symbol/symbols to alphabet letter/letters correspondence. 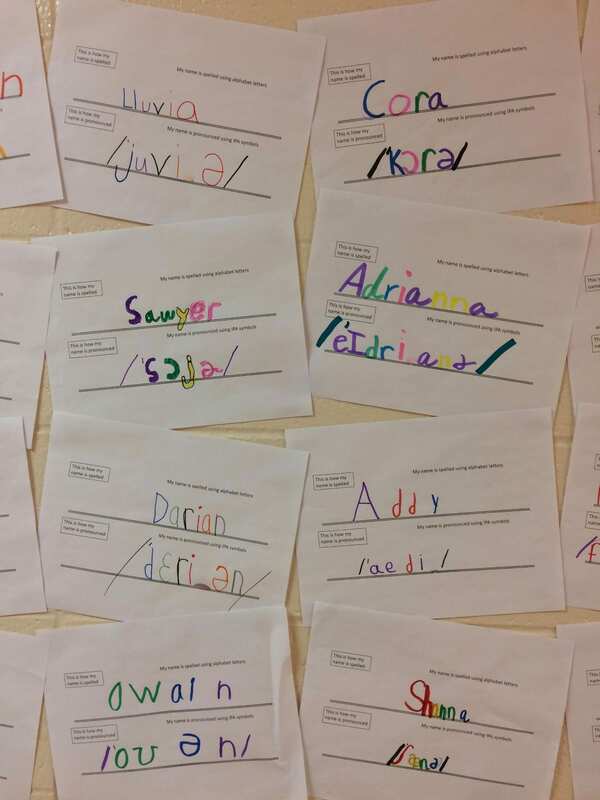 As they were doing this in their notebook, some noticed that they had unpronounced letters in their name. One example of this was Kyle. The final <e> is unpronounced. There was no IPA symbol to represent it because IPA symbols represent pronunciation, and that final <e> doesn’t have one! Finally I asked them to fill in the sheets below using the same color coding they did in their notebooks. How cool is this? We will no doubt be reminding ourselves about the importance using of the proper brackets, as well as keeping the IPA symbols a consistent size. But we are off to a great start! The students have had a good sized glimpse of one of the biggest truths I want them to know. We have something to build on here! I have this poster on the wall in my room. 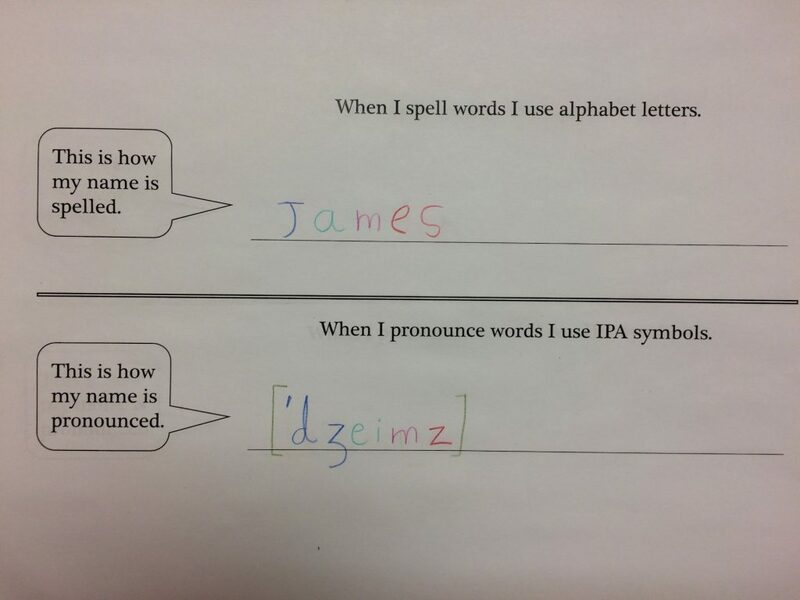 It will be fun waiting for the first students to pronounce the line of IPA. Can you do it? ***** A note to acknowledge a mistake! This morning, a friend was reading this post and watching the video and something didn’t jive. 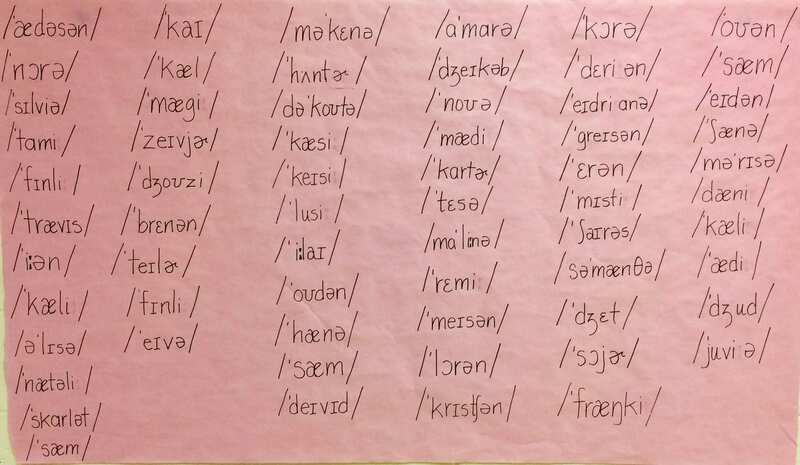 In the video you can see the list of student names in IPA. She noticed that one name was represented as [ˈjæksən], yet as I was writing the boy’s name, I was spelling it as Jackson. She wondered if the <j> in Jackson should be represented with [dʒ] since the <j> in Benjamin was ([ˈbɛndʒəmɪn]). And she is so right! (You can see our exact conversation in the comments section below). Before I was studying with the scientific framework I now use, I would have been embarrassed and ashamed at having published work with a mistake in it. But no more. I am learning along with my students and was able to model for them how to see mistakes as opportunities to learn something. I shared my error with all three of my classes today so we could discuss this [dʒ] symbol and how it was different from [ʒ] all by itself. We heard the difference in the names Jackson, Benjamin, Hyja, and Elijah. One alphabet letter with two separate pronunciations. Love this stuff!